Could you be doing what you’re doing better? Have you tried, and stalled, or worse – failed, at making lasting improvements that are embraced by the stakeholders and employees? Performance Excellence using Lean: Our Lean Consultants will review your organization and help you go through a Lean implementation. We’ll provide expert Lean Enterprise implementation assistance as you move forward and can provide training on all Lean tools, including 5S, Value Stream Mapping, and more. 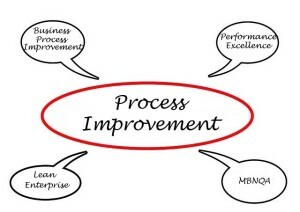 Performance Excellence using Baldrige: An experienced MBNQA Examiner works with you to review your entire process using the Baldrige assessment criteria. We’ll work with you to train your personnel, and analyze your organization to provide not only an assessment of your organization, but also a roadmap for organizational improvement across all major areas, based on the gap analysis findings. Whether for your own internal use, or in preparation for a local, state, or national submission, we’ll provide you with straightforward and actionable feedback. We’ve helped committed organizations raise their score by 200 to 250 points… and we can help you.